In the United States, definitions of homelessness help determine who is able to receive shelter and assistance from certain health and social service providers. The Stewart McKinney Homeless Assistance Act of 1987 defines a homeless person as any individual who lacks housing, including an individual whose primary residence during the night is a supervised public or private facility that provides temporary living accommodations or an individual who is a resident in transitional housing. More specifically, this means an individual who lacks fixed, regular, and adequate nighttime residence, and an individual who has a primary nighttime residence that is either (i) a supervised temporary living shelter (including transitional housing for the mentally ill), (ii) an institution that provides temporary residence for individuals intended to be institutionalized, or (iii) a place not designed for or ordinarily used as a regular sleeping accommodation for human beings. Methods for estimating the size of the homeless population are evolving and sometimes contested, and are complicated by varying definitions of homelessness. The U.S. Census, while attempting to identify the number of people who are homeless and who use particular types of homeless services, has complex and service-based definitions of homelessness. It also has recognized its limited abilities to define and enumerate the homeless (it is after all a national household survey). In 2000, the Census Bureau defined the Emergency and Transitional Shelter (E&TS) population by surveying people who use a sample of homeless services. They counted homeless people in emergency shelters for adults, runaway youth shelters, shelters for abused women and their children, soup kitchens, and certain outdoor locations. Technically, however, homeless people may reside in "E&TS," in foster care, in jails and prisons, in group homes , in worker dorms, non-sheltered in the outdoors, doubled up with families or friends, or temporarily in Census-recognized households. According to the National Coalition for the Homeless, while counting the number of people who use services such as shelters and soup kitchens can yield important information about services, applying these numbers toward estimating numbers of homeless people can result in underestimates of homelessness. Further complicating the issue of counting homeless people is the fact that, in many cases, homelessness is a temporary condition. Because of this fact, some researchers advocate a method of counting all the people who are homeless in a given week or, alternatively, over a given period of time. However, the numbers of people who find housing and the number of people who newly find themselves homeless fluctuates over time periods. In contrast, people with mental illness or substance abuse problems tend to be chronically without homes—it is difficult for many of these people to find permanent housing. Thus, while these two time-oriented methods of counting homeless can be useful, they too have statistical problems—they can overestimate the numbers of homeless people. Homelessness is an acute version of residential instability, which can be compared or contrasted with definitions of poverty. Thus the term homeless may also be extended to include people who have nowhere to go and are at imminent risk of losing housing through eviction or institutional discharge. Some definitions of homelessness further specify the duration of time without regular and adequate residence, or the types of temporary living shelter or institutions that are not fixed residences. People who live without alternatives in overcrowded or unhealthy housing conditions may be at risk of homelessness. Worldwide, national and cultural groups may have variable and often different definitions of homelessness, different terms for the condition of being without housing, and different definitions of adequate housing. For all of these reasons related both to methods of counting and varying definitions, estimating the size of the homeless population is extremely difficult. Census estimates of the size and composition of the homeless population are difficult to create, for reasons described above. The Emergency and Transitional Shelter (ET&S) Population count in the U.S. in 1990 was 178,638. It remained relatively stable in 2000 at 170,706. However, this figure does not include homeless adults not using ET&S services, sampling error, or some groups of homeless people not enumerated in the ET&S count. The ET&S population in 2000 was 61% male and 74% adult. Among the 26% who were youth, 51% were male. For adults, the population was 65% male, 41% were white, 40% were African-American, 20% were Latino of any race, 2% were Asian, 2% were Native American, and 9% were one other race alone. Another estimate of homelessness is a 1988 count of homeless people that occurred over one week, counting homeless people congregated on the street, in soup kitchens, and in shelters. That estimate was 500,000 to 600,000 people. The large variation between these estimates illustrates that, as the National Coalition for the Homeless states, "By its very nature, homelessness is impossible to measure with 100% accuracy." Homeless adults are poor and have high rates of unmet need for health care. This is in part because poverty is associated with higher risk and rates of illness, particularly mental illnesses including substance abuse. Homeless people experience disproportionate rates and symptoms of mental health disorders, including substance abuse disorders and dual diagnoses. For these reasons, large portions of federally funded homeless services are medical services, and homeless people are often viewed according to their present or past medical classifications. Studies researching the incidence, distribution, and control of a disease in a population (known as epidemiological studies) find that between one-third and one-half of homeless people have mental health disorders and approximately two-thirds have either a mental health or substance use disorder. People with severe mental illness are likewise more likely to become homeless, particularly when the disorder is co-morbid (co-occurs) with substance abuse. For this reason, changes in rates of homelessness are often associated with changes in mental health care and hospitalization policies. Mental illnesses compound the vulnerability and needs of homeless adults, as reported by the Surgeon General. Psychiatric disorders exacerbate many types of problems, including housing instability, morbidity (disease), and mortality (death). Psychiatric disorders and lack of stable living conditions complicate general health care for homeless adults. The history of homelessness is intertwined with the history of poverty in the United States. Poverty has always been problematic for humanitarian reasons and because it conflicts with the ideal of prosperity for all. Social welfare, based on individualistic ideas of deserving and undeserving poor, has improved society but not eliminated persistent poverty or homelessness. The 1960s war on poverty was a widely shared value, but in the 1980s concern about homelessness was confounded by moral evaluations of individual behaviors. While many in the U.S. have been poor or come from poor families, fewer have experienced homelessness. Therefore, the collective understanding of homelessness in the U.S. is limited in ways that the understanding of poverty is not. People with mental illness are at higher risk for becoming homeless due to challenges associated with deinstitutionalization and transition planning, and both poverty and disability associated with mental illness. Social research has studied the causes and consequences of homelessness, surveying homeless people, examining entrances into homelessness, exits from homelessness, and effects of homelessness on health and well-being. Promising explanations for increasing rates of homelessness in the 1980s have included mental disability and illness, lack of social support through jobs and marriage, increased use of drugs and alcohol, and the erosion of low-income housing in urban areas. These explanations mirror the processes of deinstitutionalization in mental health policy, unemployment, addiction and abuse, and urban decay. In other words, a direct correlation can be demonstrated between policies and trends and the rates of homelessness. As deinstitutionalization occurred, for example, the number of mentally ill people without homes increased. Consequences of homelessness include the exacerbation of problems which may have caused homelessness. Homeless people have less access to housing, jobs, health care, and basic needs like food and clothing. Isolation and lack of social support are well-documented aspects of homelessness, particularly for homeless people living with mental health or substance abuse disorders. Homeless women and men have been found to have significantly less family support than never-homeless women and men. Disaffiliation from family often limits opportunities for recovery and prevention. Services for homeless people can be divided into those providing medical care, those providing housing, and those providing other basic needs. Publicly funded agencies provide the majority of medical care, especially primary and mental health care. Public and private organizations share the responsibilities of providing shelter and housing services, through both large federal programs and smaller need and faith-based programs. Some studies find that between one-third and one-half of homeless people have mental health disorders and approximately two-thirds have either a mental health or substance use disorder. People with mental illness or substance abuse problems tend to be chronically without homes—it is difficult for many of these people to find permanent housing. Private agencies deliver most other daily needs to homeless people, through food pantries, soup kitchens, and other charities. Limited data exists on vocational services for homeless adults. Title VI of the McKinney Homeless Assistance Act of 1987 created the Health Care for the Homeless (HCH) program, authorizing federal funds for primary and mental health care to homeless people. Title VI authorizes several programs to provide a HCH program, a Community Mental Health Services block grant program, and two demonstration programs providing mental health and alcohol and drug abuse treatment services to homeless people. HCH funds support providers who offer mental health, case management , and health education services, as well as substance abuse treatment. In 1987, 109 grants were made for homeless health services with $46 million; 1996: $66 million were spent for this purpose. Now there are 122 McKinney grants in 48 states. In 1992, the Act was amended to include homeless and at-risk children, creating a medical home and source of health insurance for young people. The HCH program is the largest single effort to address the medical needs of the homeless. Each year, the HCH Program serves almost 500,000 clients in the U.S. To be a HCH service agency requires cultural and linguistic competencies, compassionate community outreach, and providers who reflect the community they serve. The federal Center for Mental Health Services oversees Projects for Assistance in Transition from Homelessness (PATH) grant program. PATH provides state funds in support services to individuals who are homeless or at risk of becoming homeless and have serious mental illnesses. These funds amounted to $22 million allocated to 365 providers in 1998. States contract with local agencies and nonprofit organizations to provide an array of services, including outreach, support services, a limited set of housing services, and mental health treatment. There are several obstacles or barriers in providing health care to homeless people. First, homeless or persistently poor people may be concerned about their work and sustenance, devaluing their own medical needs. Alienation and depression among the homeless can also be an obstacle to providing care. There can be mutual communication problems between providers and patients. Providers may lack cultural understanding that eases work with homeless clients. Finally, lack of preventive maintenance of medical care by the homeless may result in expensive and extensive needs for care, including hospital care, which may stress the capacities of certain service providers. Homelessness is both a form of poverty and an acute condition of residential instability. Homelessness is compounded by behavioral problems, mental health policy changes, disparities in health and health care, racial inequalities, fluctuations in affordable housing, and lack of social support. Overly individualistic views and explanations of homelessness do not reflect its multiple causes and effects. Like all groups, homeless people are diverse, experiencing and exiting homelessness for a myriad of reasons. Services for homeless adults likewise reflect a variety of needs and experiences. Nonetheless, homelessness remains a national and international concern, particularly in urban areas, for the twenty-first century. • Support collective public and private efforts to build homes and provide health care for people with unmet medical needs. • Become educated about the challenges faced by homeless and mentally ill people in American society. • Stop the practice of equating people in poverty and with illness with their medical conditions, instead of recognizing them as human beings. Succeeding in this step could open doors for recovery of health and housing without demeaning the humanity of people in need. Burt, M., L. Aron, and others. Homelessness: Programs and the People They Serve. Washington, D.C., U.S. Department of Housing and Urban Development, 1999. Hombs, Mary E. American Homelessness. Santa Barbara CA, ABC-CLIO, 2001. Jencks, Christopher. The Homeless. Cambridge, MA, Harvard University Press, 1994. U.S. Department of Health and Human Services. Mental Health: A Report of the Surgeon General. Rockville, MD, SAMHSA, CMHS, 1999. Smith, Annetta, and Denise Smith, "US Census Bureau, CENSR/01-2." Emergency, and Transitional Shelter Population: 2000. USGPO, Washington DC, 2001. Susser, E., S. Conover, and others. "Mental illness in the homeless: Problems of epidemiological method in surveys of the 1980s. 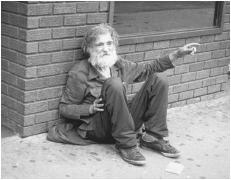 Special Issue: The homeless mentally ill." Community Mental Health Journal 26, no. 5 (1990): 391-414. Habitat for Humanity International. 121 Habitat St., Americus, GA 31709-3498. (800) 422-4828. <http://www.habitat.org/> . Health Care for the Homeless Information Resource Center. 262 Delaware Avenue, Delmar, NY 12054-1123. (888) 439-3300 ext. 246. <http://www.pra.inc/hch> . National Alliance for the Mentally Ill (NAMI). Colonial Place 3, 2107 Wilson Blvd, Suite 300, Arlington VA, 22201-3042. (703) 524-7600 or (800) 950-6264. <http://www.nami.org> . National Coalition for the Homeless. 1012 Fourteenth Street, NW, #600, Washington, DC 20005. (202) 737-6444. <http://www.nationalhomeless.org/> . National Coalition for Homeless Veterans. 333 1/2 Pennsylvania Ave., SE, Washington, DC 20003. (800) 838-4357. <http://www.nchv.org> . National Health Care for the Homeless Council, P.O.Box 60427, Nashville, TN 37206-0427. (615) 226-2292. <http://www.nhchc.org/> . U.S. Department of Housing and Urban Development. 451 7th Street S.W., Washington, DC 20410. (202) 708-1112. <http://www.hud.gov> . National Coalition for the Homeless. NCH Fact Sheet #2. February, 1999. I really feel for the homeless and if I was more wealther I would donate to the poor and poverty.